We’re getting ready for the fourth annual University Press Week from November 8-14, 2015! Since the inaugural 2012 event around the 75th anniversary of the American Association of University Presses (AAUP), member presses including UW Press have been celebrating University Press Week and the local and global contributions of scholarly publishers both within academia and the world at large. UW Press is once again participating in the 2015 Blog Tour, so watch this space. The AAUP is hosting several online events and features an online gallery highlighting some of the most surprising ideas and scholarship to come from member presses. Follow the #UPWeek and #ReadUP hashtags on social media for the best of what UPs are doing during University Press Week and all year long. UW Press will highlight contributions from our and other member presses on our Twitter feed. UW Press Intellectual Property Manager Puja Boyd. Every October, as the weather cools and the leaves fall, my inbox goes through its typical seasonal swell. Invitations to cocktail receptions. Solutions to technology problems. Requests for rights sheets. Reminders to check in for that cozy 10-hour flight to Amsterdam. As the days number down to the world’s largest gathering of publishing professionals, rights managers around the globe spruce up their uniforms (and most comfortable shoes) for the endurance event of the year: The Frankfurt Book Fair. This was my fifth ‘Messe’ and my first with the new orientation for US publishers. 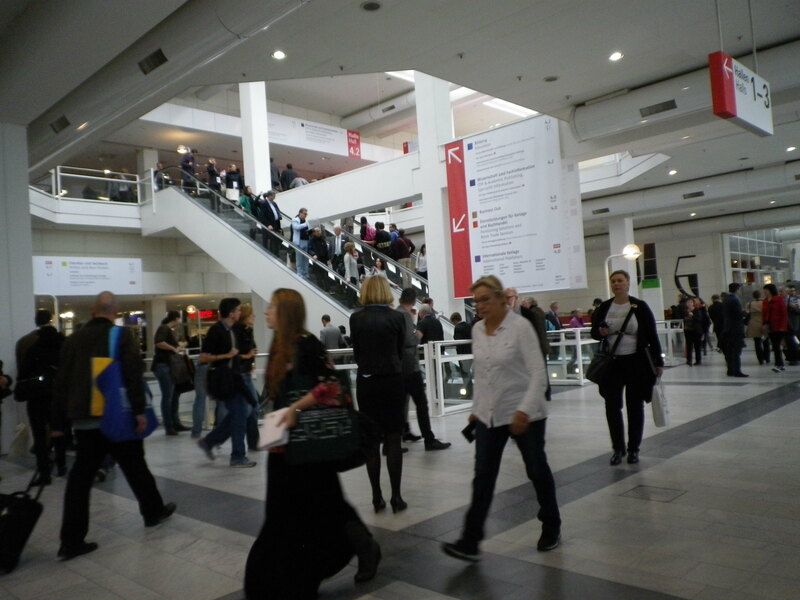 In years past, most US publisher booths were laid out in Hall 8 of the sprawling 11-building messe complex, allowing us sprinting distance (via moving walkways) to our colleagues in Halls 4-6 and a slightly longer commute to the festivities that honor each year’s international guest. We had the luxury of being placed closer to the action this year, and the challenge of re-learning our well-worn pathways to the S-Bahn, to the café, and of course, to the nearest bathrooms. The entrance to Hall 4 on opening day. As with any large gathering, the book fair offers publishers the unique opportunity to connect with colleagues across the full spectrum of the book world. Everyone from authors to publicists, printers to metadata experts, literary agents to proofreaders have a temporary place to call home at Frankfurt, and we keep busy in the hive of activity for the first three days of the event. By Saturday, the doors to the Messe open to the public and we, jetlagged and a little tired, are greeted by hordes of young readers who ambush the stalls dressed as their favorite literary characters. This has the emotional equivalent of a stranger handing you an ice-cold lemonade on the 20th mile of a hot, desert marathon. After three days of meetings and dinners, the publishing community gets to witness the sheer aliveness of its supporters, and it’s that kind of energy that jolts us into planning the next year’s schedule. Surrounded by so many beautiful books, in so many languages, I am reminded of how great it feels to be a reader. Highlights from the UWP booth include sharing forthcoming titles with agents based in China, Taiwan, and Korea; introducing a new mountaineering book to a Canadian publisher, and participating in the International Convention of University Presses in addition to the usual smattering of technology meetings, trading notes with colleagues, and the lucky happenstance conversations that seem to only occur at the Messe. Publishers around the world seem to be facing the same struggles—online sales, international distribution, the loss of bookstores—but remain optimistic about new opportunities including micro-fiction (writing designed to be read on a smartphone) and cultivating collaborative partnerships to increase reach overseas. I came away from this year’s meeting with a suitcase full of new business cards, a new favorite restaurant in Römerplatz, and the insatiable desire to be in a bookstore. Lucky for me, a new colleague had already suggested the perfect read for the long trip home. This entry was posted in Guest Post, News, UW Press News and tagged Frankfurt Book Fair, From the Desk of, intellectual property, Puja Boyd, scholarly publishing, UW Press on October 29, 2015 by uwpressblog. This fall, the UW Press is proud to co-publish a number of catalogs in conjunction with key exhibitions at museums currently on view throughout the Pacific Northwest and country. We are pleased to share tour and additional program information for the namesake exhibitions connected to two recent releases, Art AIDS America and Arctic Ambitions. Co-published with Tacoma Art Museum, Art AIDS America is the first comprehensive overview and reconsideration of 30 years of art made in response to the AIDS epidemic in the United States. This book foregrounds the role of HIV/AIDS in shifting the development of American art away from the cool conceptual foundations of postmodernism and toward a new, more insistently political and autobiographical voice. Art AIDS America surveys more than 100 works of American art from the early 1980s to the present, reintroducing and exploring the whole spectrum of artistic responses to HIV/AIDS, from in-your-face activism to quiet elegy. The exhibition is organized by Tacoma Art Museum in partnership with the Bronx Museum of the Arts and co-curated by Dr. Jonathan David Katz, director of the Visual Studies Doctoral Program at the University at Buffalo (SUNY), and Rock Hushka, chief curator and curator of contemporary and Northwest art at Tacoma Art Museum. For more on this groundbreaking show, including details on the exhibition and artists, an audio tour, and other media coverage, visit Tacoma Art Museum’s On View page. Co-published with the Anchorage Museum, the Cook Inlet Historical Society, and the Washington State History Museum and accompanying the namesake exhibition, this collection of essays from international scholars uses artifacts, charts, and records of the encounters with Native peoples to tell the story of this remarkable voyage. The collection also uses Cook’s voyage as a springboard to consider the promise and challenge of the North today as an unique meeting place of powerful forces. For more details including the full program schedule, visit the Washington State History Museum site. Gallery Talk, December 4 at 3 p.m. This entry was posted in Art and Art History and tagged Arctic Ambitions, Art AIDS America, art history, Exhibitions on View on October 23, 2015 by uwpressblog. 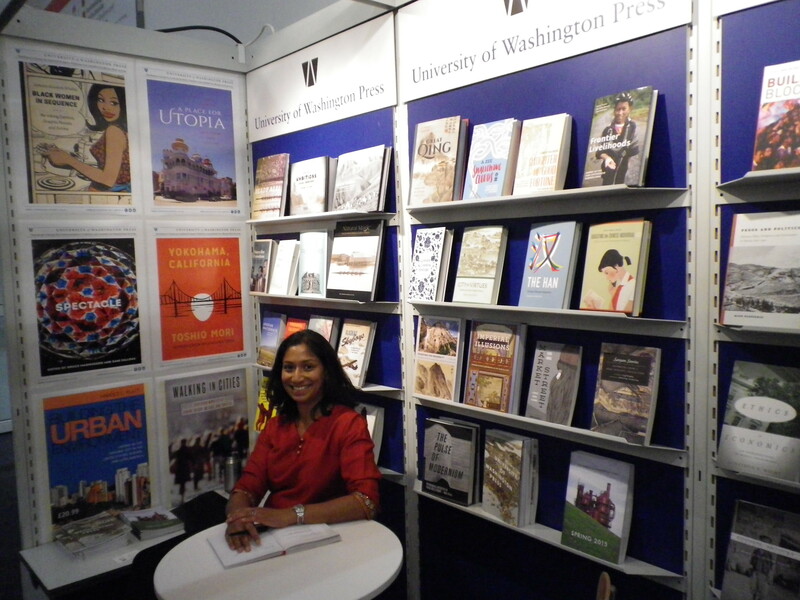 The Annual Conference on South Asia takes place in Madison, Wisconsin this week (October 22-25) and UW Press is thrilled to mark the publication of the first book in the Global South Asia series, A Place for Utopia: Urban Designs from South Asia, with a book signing with author Smriti Srinivas. If you are attending the meeting, we hope you will stop by booth #7 to check out our new and forthcoming titles in South Asian studies and beyond and to meet UW Press Executive Editor Lorri Hagman. Read on for more information about the scheduled book signing and a few featured titles. This first book in the Global South Asia series connects utopian imaginaries and practices from South Asia in the early 20th century and present with a global history of urbanisms. From the vitalist urban plans of the Scottish polymath Patrick Geddes in India to the Theosophical Society in Madras and the ways in which it provided a context for a novel South Indian garden design; from the visual, textual, and ritual designs of Californian Vedanta from the 1930s to the present; to the spatial transformations associated with post-1990s highways and rapid transit systems in Bangalore that are shaping an emerging “Indian New Age” of religious and somatic self-styling, Srinivas tells the story of contrapuntal histories, the contiguity of lives, and resonances between utopian worlds that are generative of designs for cultural alternatives and futures. Puer Tea tells the story of how the ancient leaf’s noble lineage and unique process of aging and fermentation was rediscovered in the 1990s, helping it achieve cult status both in China and internationally. The tea became a favorite among urban connoisseurs who analyzed it in language comparable to that used in wine appreciation and paid skyrocketing prices. Bodies in Balance is the first comprehensive, interdisciplinary exploration of the triangular relationship among the Tibetan art and science of healing (Sowa Rigpa), Buddhism, and arts and crafts. Generously illustrated with more than 200 images, this book includes essays on the history, theory, and practice of Tibetan medicine. This entry was posted in Asian American Studies, Asian Art, Asian Studies, Conference Preview, History and tagged A Place for Utopia, Culture Place and Nature, Global South Asia on October 21, 2015 by uwpressblog. The 55th annual conference of the Western History Association takes place this Wednesday through Saturday (October 21-24) in Portland, Oregon, and UW Press is looking forward to celebrating scholarship in the diverse history of North American Wests. If you will be attending the conference, we hope you will join us for scheduled morning book signings at booth #32 with authors Jen Corrinne Brown (Thursday) and John R. Gram (Friday). UW Press Director Nicole Mitchell, Senior Acquisitions Editor Ranjit Arab, and Assistant Editor Whitney Johnson will be representing the Press—be sure to stop by to say hello and to check out our latest Western history offerings, including titles in the Indigenous Confluences series. Historian Jen Corrinne Brown demonstrates that the majestic trout streams often considered a timeless feature of the American West are in fact the product of countless human interventions adding up to a profound manipulation of the Rocky Mountain environment. Greatly expanding our understanding of the Indian boarding school experience, historian John R. Gram reveals how some Indian communities on the edge of the American frontier had a much different experience of federal boarding schools at the turn of the century. Focusing on Pueblo Indians’ interactions with school officials at the Albuquerque and Santa Fe Indian Schools, Gram examines how Pueblo parents were able to exercise their agency, often mitigating the schools’ assimilation efforts and assuring the various pueblos’ cultural, social, and economic survival. Education at the Edge of Empire is a groundbreaking examination that contributes to Native American, Western, and education histories, as well as to borderland and Southwest studies. Through personal stories, industry publications, and news accounts, historian Katherine Johnson Ringsmuth uncovers the ways that Alaska’s aviation growth was downplayed in order to perpetuate the myth of the cowboy spirit while the industry catapulted Alaksa onto a modern, global stage. Aleksandr Baranov receives long overdue attention in this first scholarly biography of Russian America’s virtual imperial viceroy. His eventful life included shipwrecks, battles with Native forces, clashes with rival traders and Russian Orthodox missionaries, and an enduring marriage to a Kodiak Alutiiq woman with whom he had two children. In the process, the book reveals maritime Alaska and northern California during the Baranov era as fascinating cultural borderlands, where Russian, English, Spanish, and New England Yankee traders and indigenous peoples formed complex commercial, political, and domestic relationships that continue to influence these regions today. Tanoak (Notholithocarpus densiflorus) is a resilient and common hardwood tree native to California and southwestern Oregon. People’s radically different perceptions of it have ranged from treasured food plant to cash crop to trash tree. Having studied the patterns of tanoak use and abuse for nearly twenty years, botanist Frederica Bowcutt uncovers a complex history of cultural, sociopolitical, and economic factors affecting the tree’s fate. Still valued by indigenous communities for its nutritious acorn nut, the tree has also been a source of raw resources for a variety of industries since white settlement of western North America. 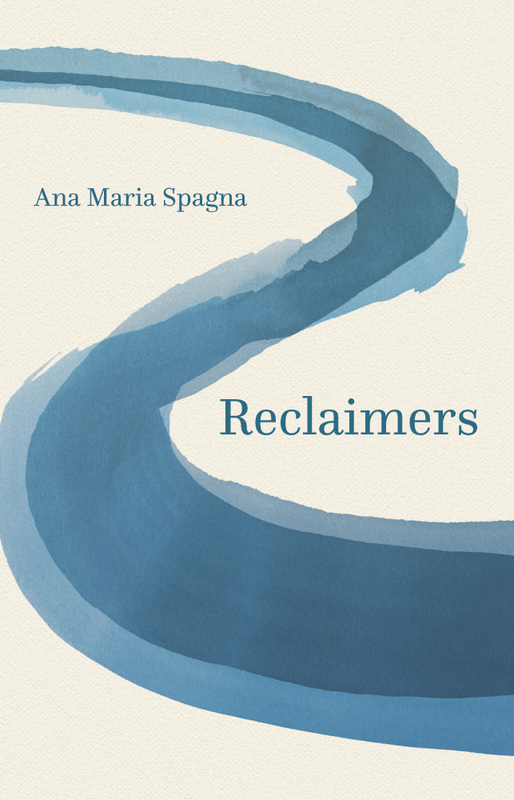 This well-researched book will appeal to readers interested in how economics and ecology intersect in tangible ways and how the resulting impacts on the land in turn impact local communities. This entry was posted in Conference Preview, Environmental History, History, Native American and Indigenous Studies, Pacific Northwest, Reviews, Western History and tagged Alaska's Skyboys, Education at the Edge of Empire, Emil and Kathleen Sick Book Series in Western History and Biography, Empire Maker, Indigenous Confluences, The Tanoak Tree, Trout Culture on October 19, 2015 by uwpressblog. 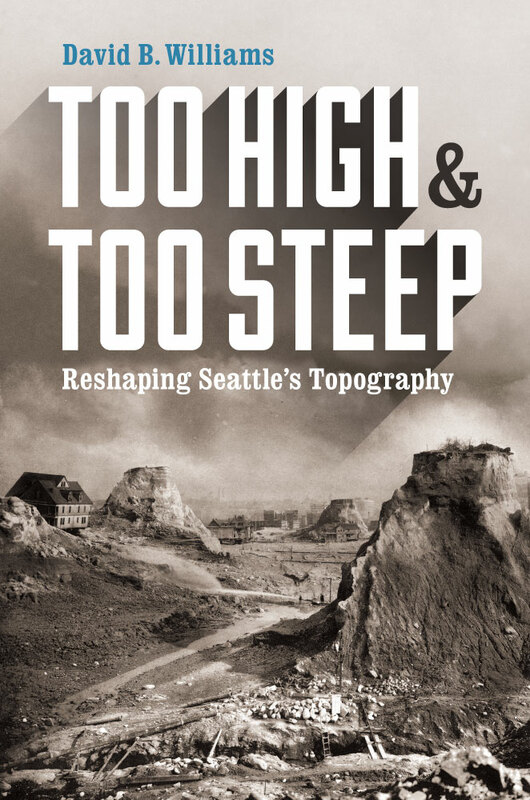 This fall, the UW Press is proud to co-publish a number of catalogs in conjunction with key exhibitions currently on view at museums throughout the Pacific Northwest and country. This catalog has been published in conjunction with the namesake exhibition, co-organized by Portland Art Museum, Seattle Art Museum, and the Paul G. Allen Family Collection. The book explores the exhibition to chronicle the evolution of landscape painting through the ages and features thirty-nine paintings, each accompanied by detailed essays that comprise a full discussion of the formal intellectual development of the landscape form. Jamie Hale of the Oregonian calls the exhibition “a rare and incredible showcase,” Alison Levasseur covers the exhibit at Architectural Digest, and Bob Hicks of Oregon ArtsWatch writes that this “blockbuster delivers the goods. The 39 paintings…make for a ravishing stroll through the art history at a high level. The selection is smart and concise, following the concept of nature through several centuries and styles and setting it provocatively on its head.” Use and follow the #SeeingNature hashtag on social media. Click through for a sampling of the collection. This entry was posted in Art and Art History and tagged Exhibitions on View, Seeing Nature on October 16, 2015 by uwpressblog. Earlier this week UW Press co-sponsored two special Seattle events: The inaugural Equity and Difference Series lecture, An Evening with Harry Belafonte, co-sponsored with the UW Graduate School and the UW Alumni Association, and a Write On! book event with Emilie Raymond, author of Stars for Freedom: Hollywood, Black Celebrities, and the Civil Rights Movement, co-sponsored with the Northwest African American Museum. With 2015 marking the 50th anniversary of several key Civil Rights moments, including the march from Selma to Montgomery and the passage of the Voting Rights Act, Stars for Freedom by Emilie Raymond reminds us that the movement was not entirely just a “bottom up” grassroots effort. At the highest levels of American society, a handful of A-list Hollywood celebrities from both sides of the color line put their careers and lives on the line to raise awareness—and money—for the cause. Raymond sheds new light on how stars such as Harry Belafonte made it easier for mainstream Americans to understand the need for racial equality while also setting an example for celebrity political activism that, a half century later, is now considered the norm. The publication of Stars for Freedom was made possible through two endowments, generously created by Virginia and Dee Wyman and Peter and Linda Capell. In 2004 the Wymans established the V Ethel Willis White Endowment to support books on African American history and culture. In 2008 the Capells created the Capell Family Endowed Book Fund to support the publication of books designed to deepen our understanding of social justice through historical, cultural, and environmental studies. We are grateful to Peter and Linda Capell and Virginia and Dee Wyman for giving us the vision that led to these events. This entry was posted in Events, News, UW Press News and tagged African American history, Capell Family Books, Emilie Raymond, Stars for Freedom, V Ethel Willis White Books on October 9, 2015 by uwpressblog.